A few years back I brewed a great batch of kolsch that was a bit hoppier and lighter than the median of the style. I wanted to brew something similar again, but with fall rapidly approaching I thought a beer that was slightly stronger (a bit of extra pils and a touch of CaraHell for added body) would be the way to go. I also wanted to switch the hops from Saaz to Hallertau since I am hoping to finally get around to a traditional Czech Pilsner recipe I have been thinking about brewing. The one thing I wanted to keep exactly the same was the nice cool fermentation with Wyeast 2565 Kolsch, which is clean but still gives a subtle apricot-wine character. Kolsch is a bit of a DC thing, mostly thanks to Bill Madden who has established it during his stints at Capitol City, Vintage 50, and now Mad Fox (where it is better than ever). His version tends to have a bit more bready malt character than Reissdorf or Gaffel (maybe it is just the freshness), but I often find them to be a bit bland. We interviewed Bill for BrewLocal (Kolsch comes up about 34 minutes in. He credits the area water, and suggests around 10% wheat malt, lots of Weyermann pils, a couple additions of German(ish) hops during the mid-boil, and the right yeast). Much like my split Hoppy Hefe and Regular Hefe batch, with this one I made two beers from a single mash. The other half of the wort was hopped with fresh hops harvested from my two first year rhizomes during the mash (but the details will have to wait for next week). If you want to brew just the kolsch you should scale the malt bill to account for your regular efficiency. 2.00 oz. Hallertau (Pellet, 3.30% AA) @ 60 min. 1.00 oz. Hallertau (Pellet, 3.30% AA) @ 5 min. Double batch sparge. Collected 9 gallons of wort ~1.048. 4.75 gallons of wort plus 1.75 gallons of water brought to a boil. Hops were generic German Hallertau, adjusted down from 3.8% AA. Chilled to ~80, strained and put in the fridge at 55. Yielded about 4.25 gallons in the fermenter. Pitched ~2 pints of the starter after 10 hours. Shook for 3 minutes to aerate. Good fermentation after ~18 hours. Dropped temp to 52 to counter the rise in fermentation temperature from the active fermentation. 9/6/10 Racked to a keg and left at ~75. Still pretty yeasty, so a bit earlier than I would have liked, but I needed the yeast cake for a Biere de Garde. 9/11/10 Pretty strong buildup of CO2. Put into kegerator and hooked up to gas to cold condition for a few weeks before serving. 11/13/10 Turned out to be a crisp, hoppy, bready, complex, session beer. Sorry I didn't take a better shot of it before it kicked (but glad it didn't kick before I got a chance to review it). It's mostly the lighting (ambient basement), although at 6 SRM it is probably a half shade darker than a standard Kolsch (in keeping with the fall theme). I highly suggest getting a cheap fountain pump ($20) from your local hardware store. 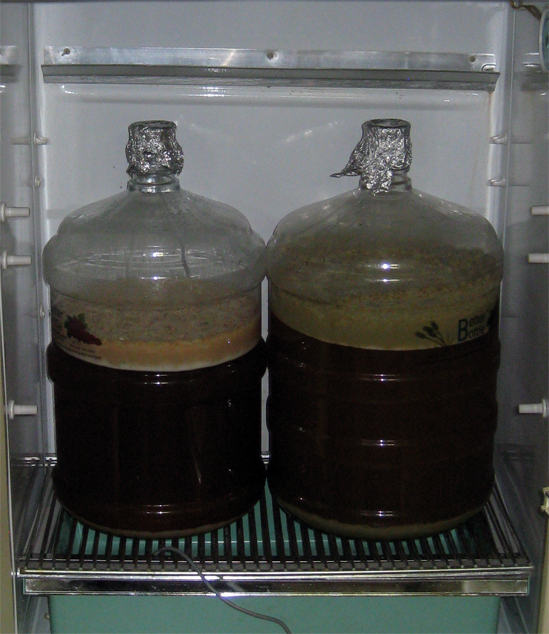 Then you can get down to reasonable fermentation temperatures. Just chill like normal for 10-15 minutes and then hook the pump up, place it in a bucket of ice water and recirculate it through your wort chiller. Getting your Kolsch down to 55-60F won't be an issue. My friend Scott does that, seems to work really well. I've taken the last few summers off from brewing, certainly something I should pick up for next year.